Dozens of Memphis police and fire employees and their families and friends gathered in a protest outside Memphis City Hall Tuesday against what they said were unfair cuts to their benefits. Tents, placards, and huge signs could be found in front of City Hall Tuesday. 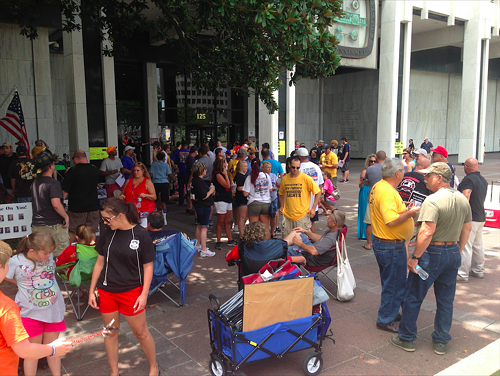 So could a swarm of public safety supporters milling around in the heat on foot or in camp chairs. The atmosphere was even festive despite the hard facts that brought the group together and despite the handful of police cruisers parked across Civic Plaza watching the crowd. Those cuts mean more money will have to come from the pockets of city employees and many retired employees to pay their health insurance premiums and more. The protest buzzed along outside as Memphis City Council heard about possible changes to employees’ pension plans from Segal Consulting in the council’s fifth-floor conference room. Depending on what new benefit structure the council approves, some employees may see their benefits cut even further. But Memphis Police Association president Mike Williams said everything could change — even the cuts in the healthcare benefits — as nothing is yet written in stone. Williams said the decision to cut the benefits should not have been made by the council. Instead, he said changes that big should have been put to Memphis voters. The changes should have at least been presented to the council just like Segal has presented the group with different pension options, he said. LauraRae Sanders and Sherrie Hopper organized Tuesday’s protest. Sanders’ father retired from the Memphis Fire Department [MFD] after more than 37 of service. She said he still has job-related health problems but her reasons for organizing the rally were bigger than that, she said. Hopper’s husband is a dispatcher with the MFD and she helped organize the protest “because I just want them to stop messing with him,” noting that last year, the mayor and the council voted to cut employee salaries by 4.6 percent. The council’s vote to cut health care benefits came two weeks ago when they approved the city budget. The council is scheduled to take the final vote on the changes to the employee pension plan in their next meeting on Tuesday, July 15.